Easy to whip together and perfect for breakfast. Lightly spiced, definitely tasting more of cider than pure apple, and perfectly sweetened. Another winner. Apologies galore, and a recipe round-up to make up for lost time. These Maple Zucchini Muffins had a very short and specific shelf life. By day 3 they were no good anymore, but for two perfect days, they were glorious. It took three batches to get these Blood Orange Spice Muffins right. It was a true exploration into the world of muffindom. What makes them tender? What makes them sweet? How can you bring out flavor and play with texture to create something wonderful, and still keep it healthy? Big questions, indeed, and with a good solid year and a half of muffin-making behind me, I decided it was time to be bold and venture where no muffin in my kitchen had gone before: an original recipe from scratch. Mini Chocolate Doughnut Muffins for a snow day, that’s what these were. The kids went back to school on January 2nd, and by the 3rd they already had a day off, thanks to an insane amount of snow. We seized the moment, slept in, and then it was time for breakfast. I decided to skip the glaze so these not-unhealthy treats wouldn’t venture into dessert territory. They’re funny-looking little things, aren’t they? Don’t be deceived. These Pumpkin Cinnamon Chip Mini Muffins are deliciously addictive, supplying decadence to the tastebuds without contributing to your food guilt. These were a lovely surprise. I hadn’t done a banana-bran combination before. Well, sort of. I’d tried these Banana-Nut Oat Bran Muffins but that was oat bran instead of wheat bran and they didn’t have real flour in them and while some people liked them, I wouldn’t make them again. So they don’t count. But I had some brown bananas sitting around, even after making my Chai Spiced Banana Muffins, and I had a hankering for something new. I also had some buttermilk to use up, and liked that this recipe looked pretty healthy but still adaptable, plus it looked like I’d get some mini muffins out of the deal as well, which are always fun. It was time to get back into the healthy swing, after whipping up requested decadent treats like Butterscotch Brownies and Chocolate Chip Pumpkin Bread. Still on a pumpkin kick, I went digging through my Pinterest board to see what might strike my baking fancy. Sometimes I’m in the market for a great, unique recipe, and sometimes I just want something I can play with. This one fell into the “play with” category, and play with it I did, for the betterment of muffinkind. I didn’t actually think they were that spicy, to be honest. Maybe they should be called Spiced Orange Bran Muffins instead, because it’s the orange that gives them the zing and then there’s a little pop of the spices to accompany it. I also just discovered (with a mouthful of muffin as I type) that they taste great with a bit of melting peanut butter on them. I’m always looking for more peanut butter recipes; anything that focuses in on peanut butter without becoming a Weight Watchers points nightmare piques my interest. So even though these were called Peanut Butter Protein Muffins, which meant that something was being prioritized along with flavor, I gave them a shot. Peanut butter does that to me. I would follow it almost anywhere. I’m back on the healthy muffin train. I was trying to come with something new to try for breakfast when I found this gem hiding at the bottom of one of my Pinterest boards. Being Canadian, I was drawn to this one by forces beyond my control. These look better, don’t they? I succeeded on all three counts. These muffins came out a little fluffier, a little prettier, and a little more delicious, but I have to be honest: I still don’t really taste a whole lotta peach. Still, I’ve had trouble holding on to them, as the kids love them and so does everybody else. I have been on a quest: the quest for a peach muffin. To reiterate what I’ve expressed in this blog multiple times, I do not like pieces of fruit in my baked goods. I don’t make or eat blueberry muffins, apple pies, cobblers, or cookies with raisins in them. But I love the taste of the fruit, so as long as the texture is pure crumb, I am happy. I also love using seasonal ingredients, when I can. Last winter I specialized in Meyer lemons and blood oranges, and now it’s summer so I’ve been making zucchini chocolate treats and have been trying to do something with peaches. I love peaches! I found some lovely peach-ginger tea that worked well in muffins, but I wanted to try using fresh peaches. What to make, what to make…I really wanted to try something new with the 3 revoltingly overripe bananas in my kitchen. And I was in a hurry because I picked up a new laptop this morning so I could blog more portably, so I wanted something simple. I struck banana gold with this one, because it IS simple, and straightforward, and delicious. Perfect amount of oats, flour, and buttermilk to create a soft but solid texture, bursting with banana flavor. Strawberry mini muffins? Please keep in mind that I am known as She Who Hates Fruit In Muffins. Really. I don’t eat blueberry muffins, cranberry muffins, raisin muffins, or any sort of fruit pie or cobbler. I do not like them, Sam I Am. I found a recipe for low fat Mocha Chocolate Chip Muffins, and in a fit of I’m still not sure what, I turned them into Espresso Muffins with Peanut Butter Chips, and they are full of dark espresso cakey goodness. 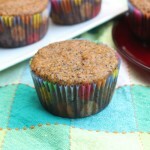 What a fun surprise these Cheerios Banana Muffins turned out to be! I had no idea you could crush Cheerios and bake them into muffins. Pinterest proves its worth yet again. I am back from my trip, operating on almost no sleep, but feeling the need to ease some stress with baking. 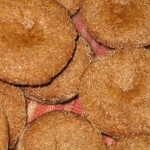 I found this recipe for Lemon Ginger Tea Muffins on Pinterest and thought it was worth a shot. I didn’t add the pistachios, though. They looked really good, but they add Weight Watchers points that I could do without, I’m trying to get back on track after some missteps. Nathaniel wasn’t feeling well at school today, so when Dave brought him home I was able to get the lemon ginger tea on double duty, brewing his up with some honey to soothe his weary throat. Should I mention he was playing Lego Harry Potter on the XBox at the time? Sick days can be fun.